A Cable Car & 268 steps to Tian Tan. Big Buddha. Ride A Cable Car & Take 268 steps to Tian Tan. 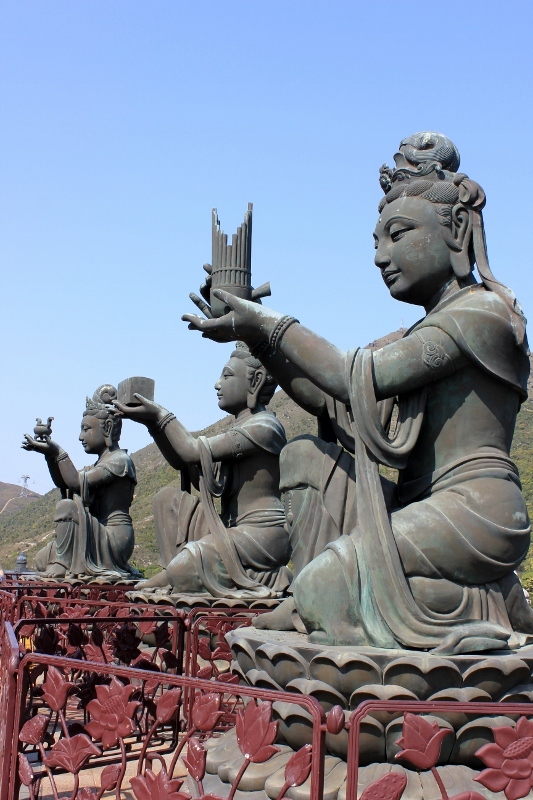 Big Buddha. 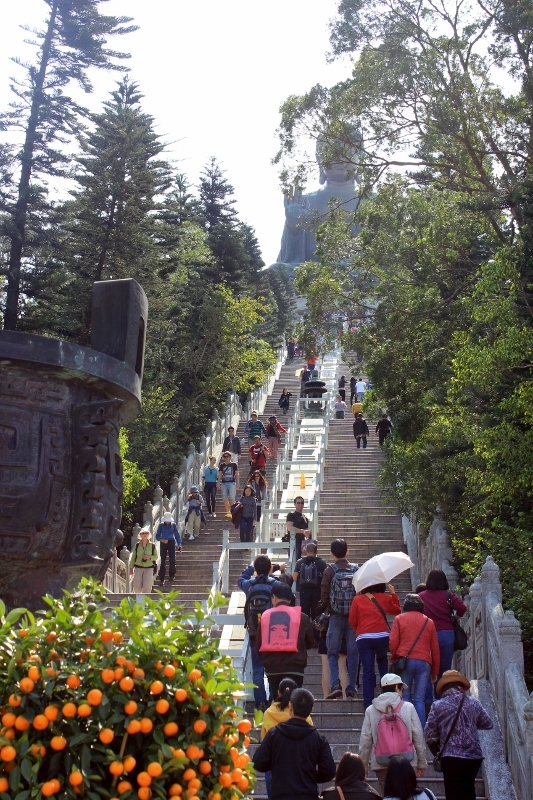 It was 463 stairs to the top of the Duomo in Florence, 129 steps to the peak of the St. Simons Lighthouse in Georgia and now there are 268 stairs to reach Hong Kong’s Tian Tan, the Big Buddha. Isn’t Hong Kong known for the longest outdoor escalator in the World? Couldn’t they figure this one out? Fine. I’ll agree to another upward adventure, but only because a missed opportunity makes me ache inside. Even one that may require an inhaler. 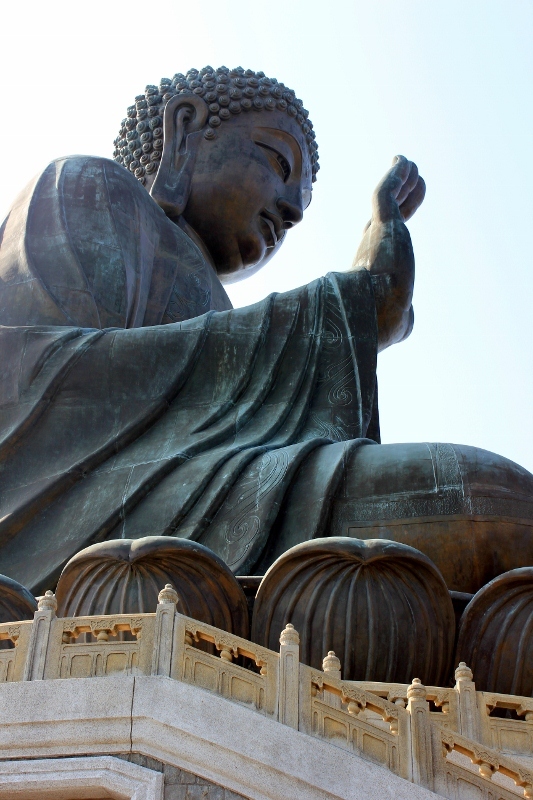 At 34 metres (112 Ft) feet tall, Tian Tan is one of the largest sitting Buddha’s in the world. Maybe not quite the biggest, but certainly breathtaking. Before actually climbing the stairs to Big Buddha you have to get its location on Lantau Island and there weren’t many options. You can take a bus, make a strenuous hike uphill or ride the 3.5 mile Npong Ping Cable Car that suspends you high above the ground. Not like the cable cars in San Francisco. At all. It definitely ain’t for the acrophobic, but buses make Peter motion sick and if I am complaining about the impending stairs, hiking just isn’t gonna happen. Option 3 please. This was one ride that could have been 20 mph faster. Water to the left, water to the right, water to the…okay I get it we are suspended above a lot of freakin’ water. On more than one occasion, during the 25 minute ride, the thought of plummeting to my death did occur. But, the cable car dropped us off right at Npong Village, unscathed. You could see Buddha lurking from afar, but that wasn’t close enough for me. We hydrated at the local Starbucks (yep, it is just that touristy) prior to the uphill journey commencement. An iced vanilla latte has to help with stamina. My climb game plan was simple; slow, steady and one step at a time, while Peter thought it would be smarter to “rip it off like a Band-Aid”, taking two stairs at a once. Wait for me at the top. Turns out that one step at a time wasn’t quite slow enough, so every set of fourteen stairs there was also a convenient “photo break”. Sometimes the lens cap wasn’t even removed. As always, the lung gasping and jittery legs were worth the spectacular view. 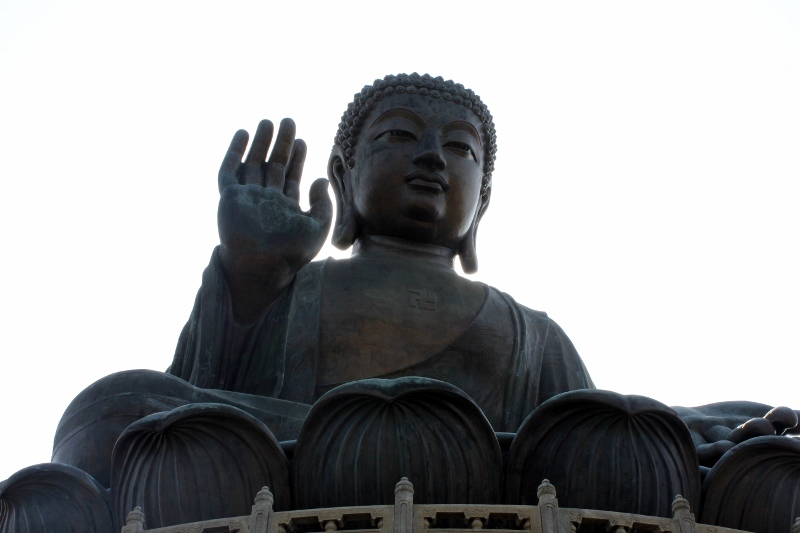 It is difficult to grasp the immense size of all 250 metric tons of the Tian Tan Buddha unless you are up close and personal. 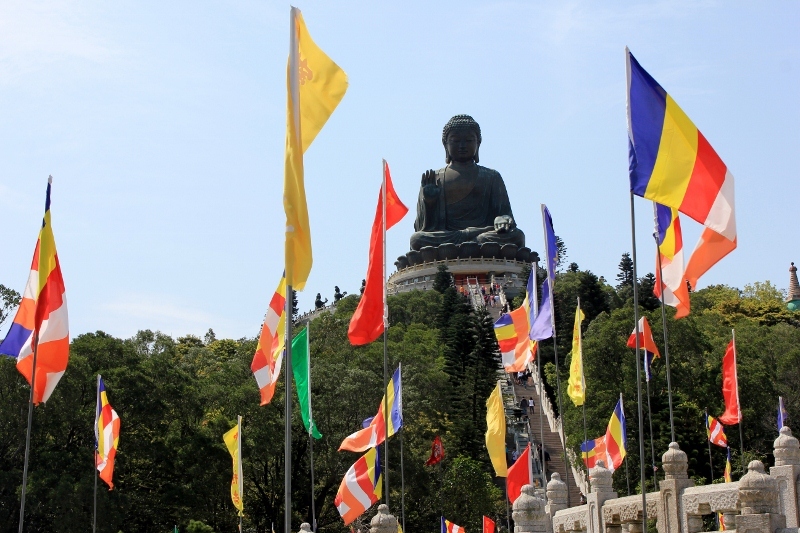 Would you have taken the cable car or the bus to Big Buddha? Is seeing Tian Tan on your bucket list? 3 Day Hong Kong Itinerary. The Plan. Ride the Longest Escalator in the World. Mid-Levels in Hong Kong. Visit an Offbeat Asian Market. Hong Kong’s Goldfish Market. The cable car was slightly freaky when you thought about the thin cables holding it up, but it was a memorable adventure! From where buddha sits, the place is awesome.. Very cool…I would have been all over the cable car and the hike. What a view! That is one huge Buddha! The cable car is 3.5 miles!!!! I just had a panic attack. im definitely riding the cable car.. and see water to the left and water to the right 😀 thanks for the tip! 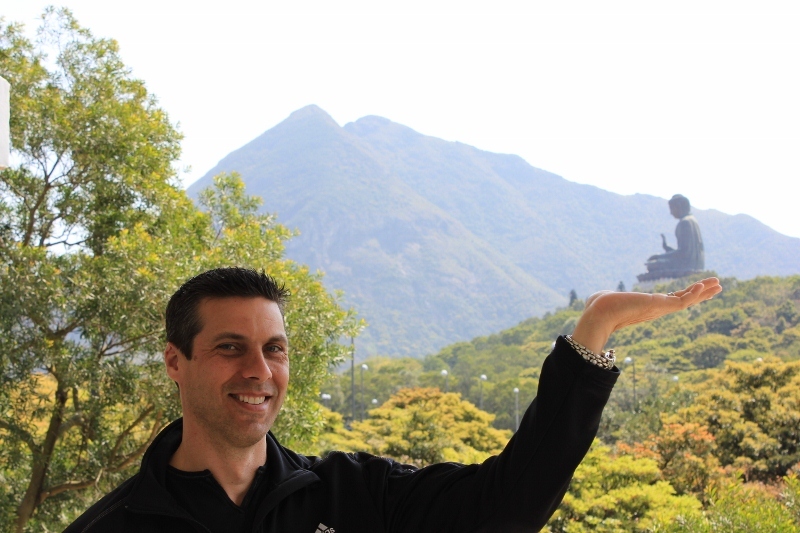 how long did it tak you to climb to the big buddha? Hi. 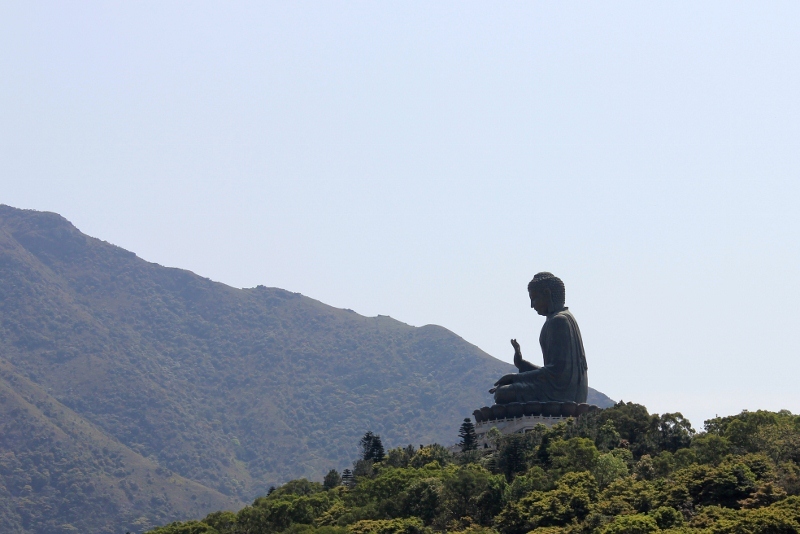 Referring to the first photo, of the view of the Buddha, from afar, could this photo be snapped only from cable car? 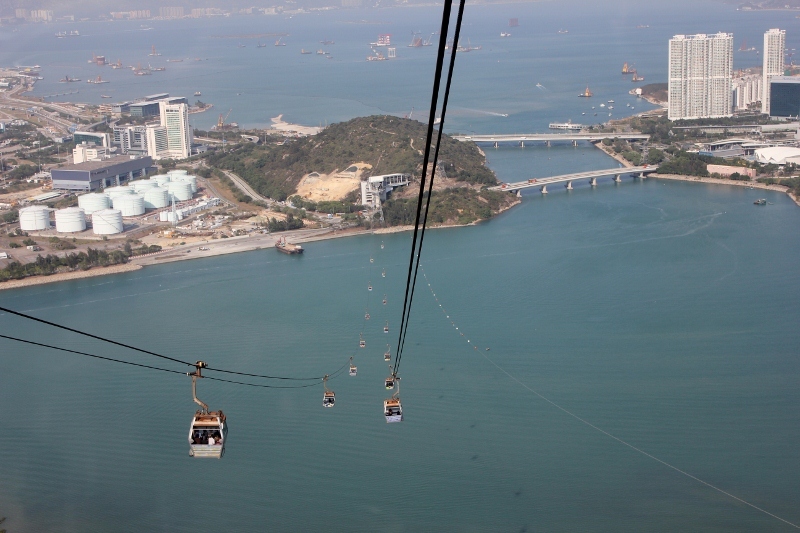 Though that photo wasn’t taken from the cable car, I have seen a few others similar that were. So, I think you can get a shot! We took the cable car both ways. I’m a little scared of heights but I took it like a champ. We rode up with a quiet family from Vancouver and rode back by ourselves. 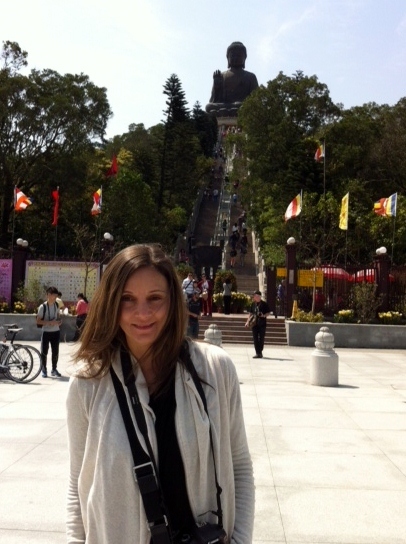 The cable car was just as interesting as seeing the Buddha! Yay to you for conquering your fear! I agree that the cable car was just as much of a highlight.